Individual miniature previously only found in the Assassinorum box-set. The Eversor is a stimulant fuelled killing machine, deployed to strike fear and terror among enemy ranks. Used as a shock tactic, the Eversor possesses the ability to effortlessly end the lives of enemies far larger and influential than itself. 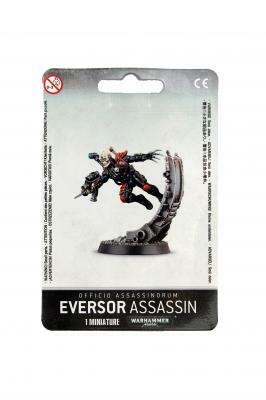 This pack contains one multi-part Eversor Assassin, and is supplied with one Citadel 32mm Round base.